A mainstay of entertainment for a number of decades, Biggins made his pantomime debut aged just 17 in his home town of Salisbury before forging a highly successful career in show business. Best known for his numerous iconic television appearances, Biggins appeared opposite the late Ronnie Barker in the iconic BBC sitcom Porridge, held roles in Whatever Happened to the Likely Lads?, appeared alongside Michael Crawford in Some Mothers Do ‘Ave ‘Em and played Nero in the critically acclaimed dramatisation of I, Claudius. Despite his serious roles, and never one to not entertain, Biggins is also known and well-loved for his hosting credits, including co-hosting Surprise, Surprise, On Safari, appearing on numerous celebrity specials and as King of the Jungle having won ITV’s I’m a Celebrity…Get Me Out of Here! in 2007. On stage he has starred as The Baker in Joseph and the Amazing Technicolor Dreamcoat, played Herod in Jesus Christ Superstar (a role he reprised for the film version where he starred alongside Donnie Osmond and Joan Collins), and the Baron in Chitty Chitty Bang Bang in the West End. He also narrated the live stage tour of The Rocky Horror Show, based on the cult film in which he also appeared. It is pantomime for which Biggins is best-known and most-loved, entertaining thousands of festive theatregoers every year since he began his regular panto appearances in the mid-80s. From Glasgow to Plymouth, Biggins has donned a host of outrageous frocks and had audiences in stitches across the UK ever since, starring alongside the likes of David Hasselhoff, Patsy Kensit, Simon Callow, Bonnie Langford, Cannon and Ball and even Basil Brush. Biggins last performed in pantomime at the Alhambra Theatre thirty years ago alongside The Krankies. This year’s production of Aladdin marks his ninth trip to Old Peking where he will take up residence in the iconic laundry and star as Widow Twankey. 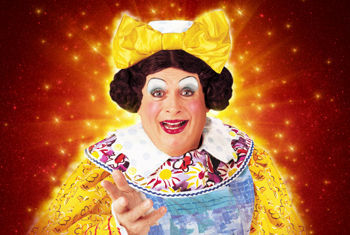 Biggins joins Bradford pantomime royalty, Billy Pearce in his 20th Alhambra Theatre pantomime. As previously announced Billy will star alongside him as Wishee Washee in a production packed full of magic, mayhem and laughter. Recently Billy became the second ever recipient of the Welcome to Yorkshire Pride of Yorkshire award at their annual conference held at the Alhambra Theatre. With further star casting to be announced, and record-breaking sales already achieved, audiences should hop aboard their flying carpets and point them towards the Alhambra Theatre Box Office to secure their seats for Bradford’s iconic family pantomime!